The portrayal in verse of the enemy soldier has been one of this blog's recurring subjects. Rarely glimpsed during the First World War, Fritz is most likely to be encountered as a corpse, 'Dribbling black blood from nose and beard', or lying inert while a 'happy warrior' stabs him again and again. The best time for conversation and reconciliation between warring soldiers is after death. The dead German in 'Strange Meeting' recognises the poem's speaker, 'For so you frowned / Yesterday through me as you jabbed and killed'. Similarly, Ivor Gurney imagines in 'The Target' that, if he is killed, he will seek out the man he shot, 'And ask his pardon, if I durst.' After all, as Thomas Hardy had pointed out several years previously, killing someone in war is nothing personal. Even when Fritz is alive, poets find it hard to muster any animosity towards him. Gurney's own attitudes are complex and shifting, but as I argue in this essay, he reserves his outbursts of rage for letters rather than poetry, and for Germany as a nation rather than for individual soldiers. David Jones goes so far as to dedicate In Parenthesis partly to 'the enemy front-fighters who shared our pains against whom we found ourselves by misadventure'. Resisting all this fellow feeling for the brotherly enemy, the most contemptuous account of Fritz that I have read is given by John Allan Wyeth, whose sonnet, 'Souilly: Hospital', describes how the 'rancid bodies' of POWs inspire his 'dull and cruel laughter'. The greatness of the poem stems from Wyeth's deliberate refusal to offer the sentimental response expected by his readers. Soldiers sometimes fantasise about killing Germans. Robert Service, like Sassoon, can write poems imagining the joy of bayoneting them --- 'I'm 'untin' for someone to christen me bay'nit', as the charmless speaker of 'My Bay'nit' puts it. However, bloodthirsty rhetoric gives way to compassion when an injured German soldier needs assistance. The title of Service's 'Only a Boche' seems increasingly ironic, as the Boche is discovered to be a mirror-image, a married man and a family man with cherubic daughters whose curse it will be to experience their father's death 'again and again'. For Service's place among Canadian war poets, see here; and here is an assessment of another poem from Rhymes of a Red Cross Man. *For the title of his poem, Graves used the commonly used First World War term ‘‘Boche’’ to describe a German soldier. A disparaging derivation of the French word caboche for cabbage, it was used more loosely to mean ‘‘square head’’. Ironically, Graves’s mother was German and seven of his cousins were killed fighting in the German army. **A Dead Boche appeared in Graves’s second book, Goliath and David, which was published after he returned to France in January 1917. He and Sassoon, who was preparing his own first volume, The Old Huntsman, had worked together on their poetry at the end of the previous year while convalescing after periods in hospital. A manuscript version of A Dead Boche in IWM’s archive shows Sassoon’s influence, with the words ‘I’ll say’ and ‘”War’s Hell!”’ added in Sassoon’s handwriting and the poem’s two stanzas reversed into their published order. ***The village of Mametz was captured on July 2, 1916, the Battle of the Somme’s second day. Yet an advance into nearby Mametz Wood, although it was only lightly defended, was not undertaken for some days. From July 7-12, the 38th (Welsh) Division attacked through the broken trees of the wood. Its capture cost almost 4,000 British casualties, including 600 dead. 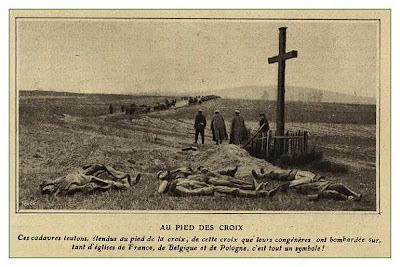 The ground was littered with debris and both British and German bodies, as Graves discovered when he arrived in the wood only days after the end of the fighting.